What’s the difference between an open and closed photo booth? An enclosed photo booth has a defined space with a curtain for a little more privacy. To create an enclosed photo booth, we would set up our photo booth unit, and set up drapery around the unit to create an enclosure. An open photo booth doesn’t have a defined space. Because our photo booth is mobile, an open photo booth allows for greater flexibility. We can set up an open photo booth anywhere with a power outlet. Can we come by and see the photo booth? Absolutely! Call us at 925-373-1934 to let us know when you’d like to stop by so that we can make sure the photo booth is set up and ready for you to test. Does your photo booth shoot video? Yes. The video message option is available in our standard package. Can I get a copy of all the pictures? Yes, our photo booth automatically saves every picture it takes. We can upload the photos to Facebook and/or put them on a CD for you. 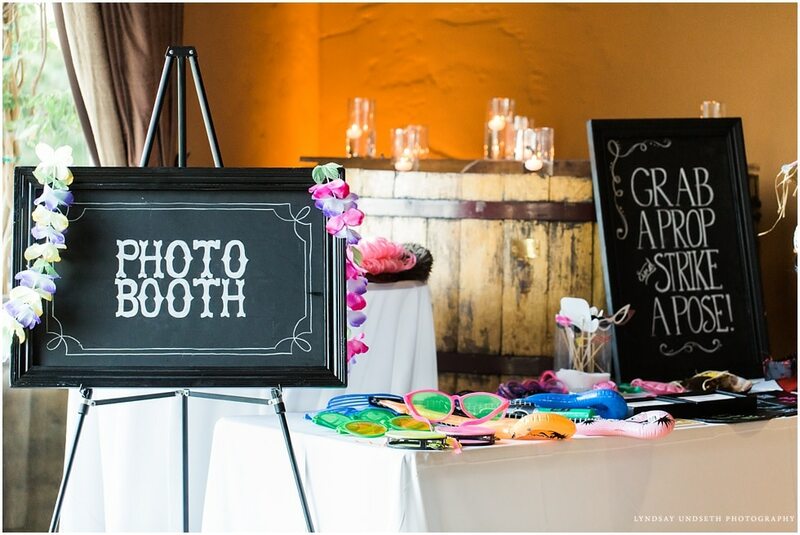 If you are interested in a guestbook for all of your photo booth photos, we encourage you to buy your own. Our technician can put each photo strip into the photo book as they are printed to create a wedding keepsake for you. Can I customize the photo booth? Yes! Our standard photo booth comes with a black backdrop. If you want something different, speak to one of our consultants about your vision and we would be happy to work with you. You are also welcome to provide your own backdrop. Do I have to pay extra for props? Nope! All of our photo booth rentals come with its own box of props, like hats, funky glasses, boas, masks, microphone, maracas, chalkboards and more! What if I decide day-of that I want the photo booth for extra time? Our photo booth is available for up to 6 hours. If you need more time with the photo booth, it is available for $150.00 each additional hour. Can we take black and white photos or only color? Yes you can take black and white photos. Our photo booth unit measures approximately 1.5’x6′. We can create a closed photo booth customized to your needs, or leave the photo booth open. Will someone be there to accommodate guests in the booth? Yes, there will be a technician onsite for the duration of your event to ensure everything is running smoothly with the photo booth. The photo booth takes about 15 minutes to set up. We will have the photo booth at your event an hour before to make sure we have plenty of time to set up and test all of the settings. Do you need anything from me on the day of the event? All we need is a standard power outlet near the photo booth will be, and level ground to set up. Once the session is over the printer will start printing, and the photo strips will come out, pre-cut, 8-10 seconds later. Yes, your photos will be uploaded to the Fantasy Sound Facebook page for easy access so you and your friends can see all of the photos. We do filter the photos that go up on our site to make sure all content is appropriate. As many as you want! Your photo booth package comes with unlimited photos so ever goofy grin and precious moment can be captured. Yes. If you think there’s going to be a problem, we can implement a plan to make sure everyone in the event can participate in the fun. Nick and the team at Fantasy Sound are amazing! Our venue looked great with the uplights and gobo with our name on the wall. They took care of everything that made sure that every single nook of the place with looking amazing! Thanks for making the day special! Fantasy Sound is very professional and always willing to help with differnt ideas for your special day!